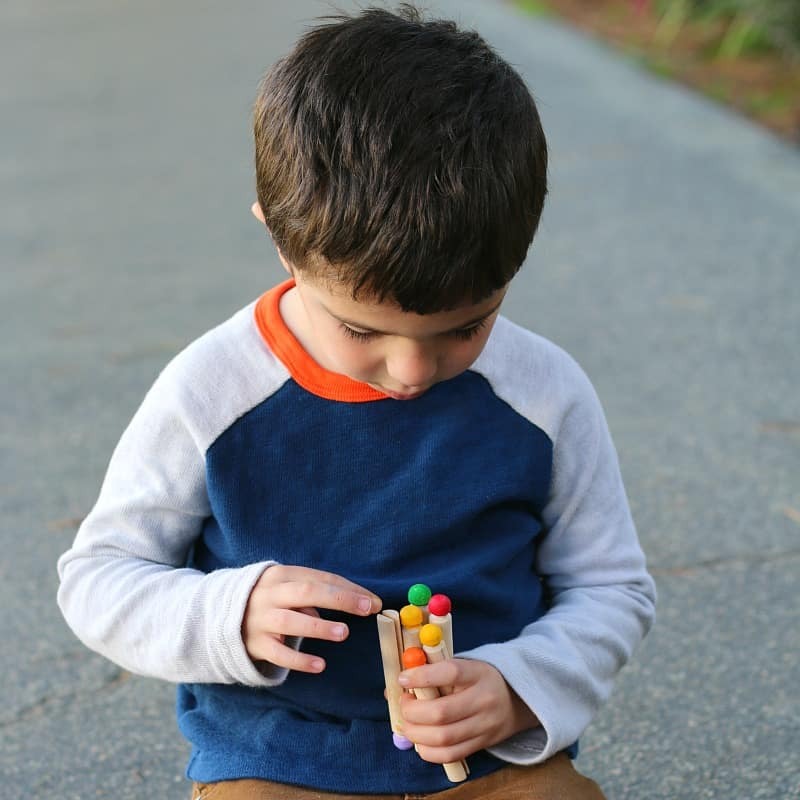 Please welcome Chelsey from Buggy and Buddy who joins our ABCs and 123s letter and math series today with a super counting game you can play indoors or out. 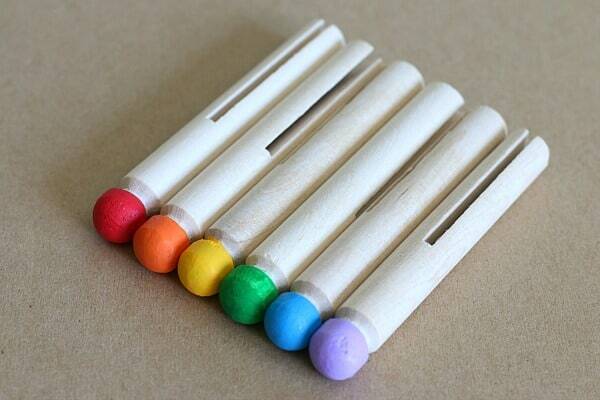 This clothespin drop math game is perfect for counting practice and developing hand-eye coordination. It can be played independently, with a friend, or with a small group and is super easy to make! My kids always go crazy for any activities involving movement (like with our gross motor dice game)! This particular math game is a great way to incorporate counting practice with kinesthetic learning. It can be played outside and also makes a fun indoor game if you’re stuck inside on a rainy or snowy day. 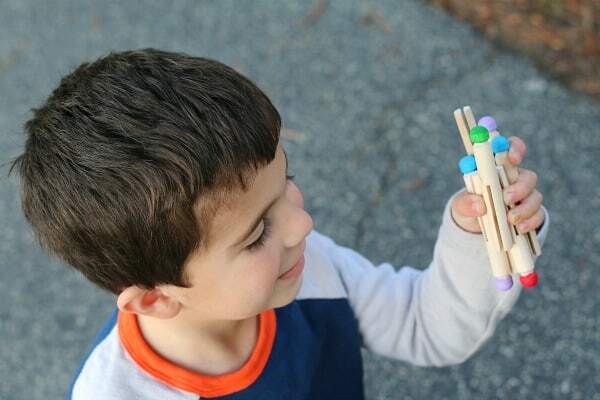 This clothespin dropping game is really easy to make and setup- you’ll only need a few materials. The kids and I decided to paint the tops of each of our wooden clothespins different colors. Not only did the colored clothespins made playing as a group easier, allowing players to each choose their own color of clothespin to use for the game, it was also a fun way to incorporate creativity into the setup. The kids loved the sensory aspect of painting on the wood, and it helped them develop a sense of ownership with the activity itself. 2. Give a player 5 wooden clothespins. 3. 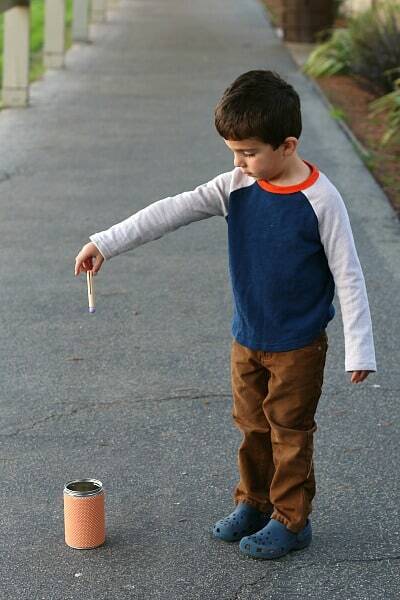 Hold one clothespin in your dominant hand and extend your arm over the can so it’s parallel to the ground. Drop the clothespin. Try to get it to land inside the can. 4. Try this with all 5 clothespins. Count how many clothespins landed inside the can and how many landed outside the can. Compare the numbers. Which is greater? Which is less? Play with a friend or small group. Take turns dropping your clothespins into the container. Count how many each player got to land successfully inside the can. Compare the results. 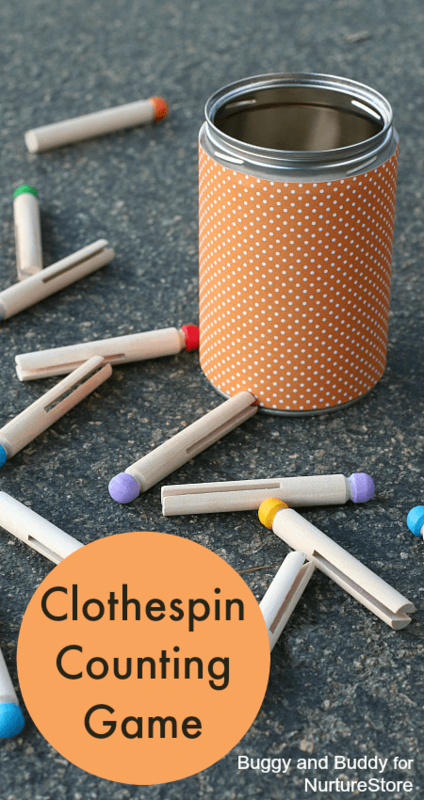 Drop different colored clothespins into the can. When you’re done, sort the clothespins by color. Try dropping clothespins with your non-dominant hand. Was it easier or harder? Older children can sketch the results of their game in a math journal. What I love about the simplicity of this game is that it really allows the kids to come up with all kinds of variations on their own as they’re playing. You’ll be surprised at all the different ideas children will come up with as you observe their play! Gross Motor Math Game- Action Dice: Practice counting and one-to-one correspondence while doing fun body movements like clapping and jumping. Pete the Cat Subtraction Game: Introduce your child to subtraction with this fun game using buttons. Number Fishing Game: Practice number recognition with a magnetic fishing game! Chelsey is the creator of Buggy and Buddy– an extensive resource for parents, homeschoolers, and classroom teachers to find ways to inspire creativity and self-confidence in their children while promoting learning and fun. On Buggy and Buddy you will find all kinds of creative play, learning experiences, and art projects to inspire you and your children to become lifelong learners and creators! Follow Buggy and Buddy on Facebook and Pinterest!